*To better reflect SRE real-world rates, the clinical trial annual rates are adjusted for all treatments including the no-treatment arm. Annual SRE rates were extrapolated from real-world data. Based on real-world data, a conversion factor was applied to SRE rates from the Phase III clinical trials. The adjustment factor used was estimated to be 2.84.1 This value is multiplied by the crude annual SRE rate described above to estimate treatment-specific real-world SRE rates. *Value assumed to be the same across cancer types and SRE type. *Value assumed to be across cancer types and SRE type. Qian Y, Bhowmik D, Kachru N, Hernandez RK. Longitudinal patterns of bone-targeted agent use among patients with solid tumors and bone metastases in the United States. Support Care Cancer. 2017;25:1845-1851. Centers for Medicare & Medicaid Services. 2017 ASP drug pricing files website. https://www.cms.gov/Medicare/Medicare-Fee-for-Service-Part-B-Drugs/McrPartBDrugAvgSalesPrice/2017ASPFiles.html. Accessed November 19, 2018. Zoledronic acid prescribing information, Novartis. Arellano J, Hernandez RK, Wade SW, et al. Prevalence of renal impairment and use of nephrotoxic agents among patients with bone metastases and solid tumors in the United States. Cancer Med. 2015;4:713-720. Neumann PJ, Cohen JT, Weinstein MC. 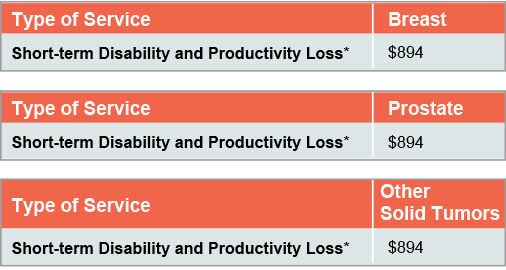 Updating cost-effectiveness—the curious resilience of the $50,000-per-QALY threshold. N Engl J Med. 2014;371:796-797. Pavlakis N, Schmidt R, Stockler M. Bisphosphonates for breast cancer. Cochrane Database Syst Rev. 2005;20:CD003474. Saad F, Gleason DM, Murray R, et al. A randomized, placebo-controlled trial of zoledronic acid in patients with hormone-refractory metastatic prostate carcinoma. J Natl Cancer Inst. 2002;94:1458-1468. Stopeck A, Rader M, Henry D, et al. 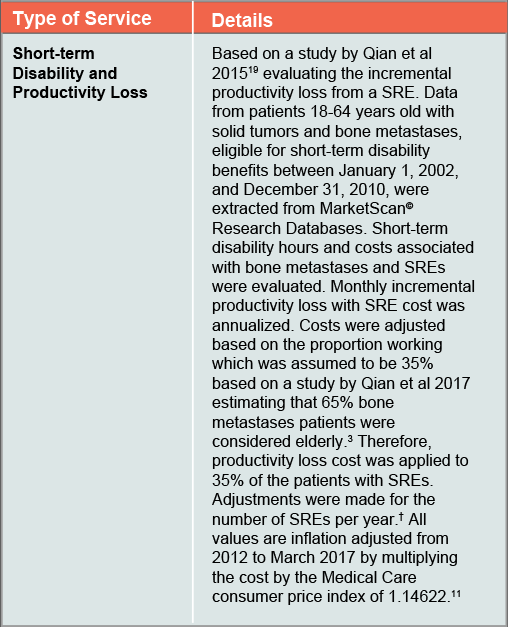 Cost-effectiveness of denosumab vs zoledronic acid for prevention of skeletal-related events in patients with solid tumors and bone metastases in the United States. J Med Econ. 2012;15:712-723. Bureau of Labor Statistics Medical. CPI-all urban consumers (current series) website. https://data.bls.gov/timeseries/CUUR0000SAM?output_view=pct_12mths. Accessed November 19, 2018. Nash Smyth E, Conti I, Wooldridge JE, et al. Frequency of skeletal-related events and associated healthcare resource use and costs in US patients with multiple myeloma. J Med Econ. 2016;19:477-486. Jayasekera J, Onukwugha E, Bikov K, et al. The economic burden of skeletal-related events among elderly men with metastatic prostate cancer. Pharmacoeconomics. 2014;32:173-191.
von Moos R, Body JJ, Egerdie B, et al. Pain and analgesic use associated with skeletal-related events in patients with advanced cancer and bone metastases. Support Care Cancer. 2016;24:1327-1337. Delea T, Langer C, McKiernan J, et al. The cost of treatment of skeletal-related events in patients with bone metastases from lung cancer. Oncology. 2004;67:390-396. Xie J, Namjoshi M, Wu EQ, et al. Economic evaluation of denosumab compared with zoledronic acid in hormone-refractory prostate cancer patients with bone metastases. J Manag Care Pharm. 2011;17:621-643. Bell MJ, Miller JD, Namjoshi M, et al. Comparative Budget Impact of Formulary Inclusion of Zoledronic Acid and Denosumab for Prevention of Skeletal-Related Events in Patients With Bone Metastases. Poster presented at: ISPOR 16th Annual International Meeting; May 21-25, 2011; Baltimore, Maryland. Gridelli C, Ferrara C, Guerriero C, et al. Informal caregiving burden in advanced non-small cell lung cancer: the HABIT study. J Thorac Oncol. 2007;2:475-480. Qian Y, Song X, Zhang K, et al. Short-term disability in solid tumor patients with bone metastases and skeletal-related events. J Med Econ. 2015;18:210-218. Matza LS, Chung K, Van Brunt K, et al. Health state utilities for skeletal-related events secondary to bone metastases. Eur J Health Econ. 2014;15:7-18.